Herbs are one of the most common items we throw out. You cook an awesome recipe that calls for a tablespoon of parsley - now what do you do with the bunch-minus-a-tablespoon of parsley? The leafier, lighter herbs can often be used interchangeably, including mint, parsley, cilantro, basil, tarragon, oregano, dill, fennel fronds, chervil, and chives. Scatter torn leaves onto a salad or pizza, make into salsa verde or pesto, extend their life as an oil or in a syrup or browse below for more options! I like to keep herbs like fresh flowers, in a container with some water at the bottom. Basil browns pretty quickly in the fridge so keep it on the counter, but the rest of the herbs will last a pretty long time in the refrigerator. The picture below is of herbs almost 2 weeks old - they don't look as vibrantly green or leafy as the photo above, but they're absolutely still usable. You can also store them like salad greens, in a loosely wrapped bag in the refrigerator. Fresh herbs are best as garnish or in raw salads, but wilted herbs can be used in nearly every other recipe. As long as they're not slimy, brown or rotting, they can be used in condiments from herb oil to sauce to dip to butter, or dishes from bread pudding to frittatas. Herby Green Sauce aka Your Version of Salsa Verde, Chimichurri, Pesto, Etc. Got wilting herbs and need to make a quick rescue? The following are my go-to methods to not waste expensive fresh herbs. If you only have a few minutes, place the herbs in olive oil to make an infused oil. If you have a bite more time, blitz the herbs and oil in a food processor to make Herb Oil. Got any empty ice cube trays? 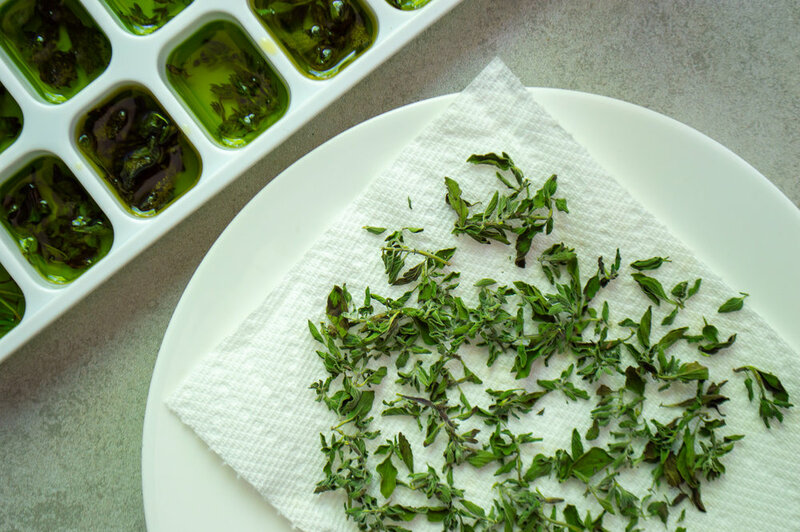 Put a spoonful of chopped herbs into each cube, cover with olive oil or melted butter and freeze. Once the cubes are frozen solid, you can transfer them to an airtight bag. You can also freeze the herbs whole (I always seem to have frozen rosemary in a bag in the fridge) but this works better for the sturdier herbs than the leafier herbs, which may blacken. Tie up your extra herbs with twine and rubber bands and let them air-dry in a cool room with some good air circulation, according to Bon Appetit (which has some other good herb tips here. According to Save The Food, herbs can be dried in the microwave! Remove stems, place on a plate between paper towels and microwave for a minute, then in 20-second intervals until dry.